Our review: Short story anthologies have slowly been growing on me within the past year. 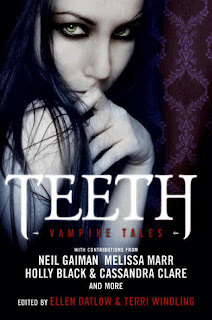 The latest one I've tackled is Teeth: Vampire Tales. This spring title boasts 19 stories from authors I am familiar with and some I'm not. That's the positive factor anthologies have going for them: readers have the opportunity to sample a writer's style and voice. There were quite a few writers here I discovered and will search out for more of their individual works. Instead of mentioning all of the titles for this review I picked my favorites. That does not imply I didn't like the others. I enjoyed them all and was glad to see the varying degrees authors took with the popular bloodsucking creatures and their lore. "Things to Know About Being Dead" by Genevieve Valentine, was an appealing story about Suyin who dies and comes back as a jiang-shi. She also brings back a ghost boy named Jake who keeps her company. Her grandmother is the only one who knows what's going on with her. Suyin learns, with help from her grandma, how to cope with her newfound deadness. I liked the lore of the jiang-shi and Suyin's relationship with her grandma. "Gap Year" by Christopher Barzak piqued my curiosity. Lottie's adjusting to having vampires living among humans. One vamp, Trevor, speaks at her high school, and she is not sure if she's genuinely interested in him or if he's controlling her mind. She leaves school early and talks to him in the parking lot. When he offers her a ride home she wants to refuse but doesn't. The two become acquaintances of sorts and she discovers she has vampiric abilities to take other's emotions. At the end when Lottie decides she wants a gap year between graduating and starting college so she takes advantage of her new 'friend' as well. "Vampire Weather" by Garth Nix was offered us an interesting spin. Amos lives in the time of vampires and is bitten by one after his protection is taken by a girl named Tangerine's kissing him. He has 24 hours to get vaccinated or he will change. "All Smiles" by Steve Berman is just yelling for a full length novel. Main character Saul is an escapee from Cotre Ranch, an "outdoor behavoiral health care facility" for kids to "kick their drug habits". Saul is picked up one night in the pouring rain by two people, Marley and Dutch. Cool looking, attractive, he wonders if these two are what they seem. Just when you think the story is going one way, Berman slams you into a completely different area and Saul is more complex than he seems. The convenience store scene was cool and I really liked Saul's tatoo which read "And you shall bind them as a sign upon your hand". I wanted to keep reading to find out what Saul does and how Phelps comes into play. I'll never look at an aerosol can again without thinking about Saul. Please, Mr. Berman, let's see Saul and his world again! I liked "Transition" by Melissa Marr. Teen girl Eliana is killed by pretty girl Nikki while her companion Sebastian watches. When Eliana awakens as a vampire betrayal, independence, desire, meld together in her new world until she figures out who she really wants to be. Is there anything Marr can't write? "History" by Ellen Kushner was a sweet and melancholy character study between a human college student and her older vampire lover. This one also screams "novel!" "The Perfect Dinner Party" by Cassandra Clare and Holly Black was a bit on the dry and ironic side. Brother and sister vampires change the directions of their lives over the course of one dinner. Charles wants a human girl, his sister Jenny doesn't think the girl is up to the standards enacted by their maker, Mr. DuChamp. "Slice of Life" by Lucius Shepard is another one I immediately pictured as a book. A girl named Louie is slutty and happens to have a great body. She has befriended a vampire, Sabrine, who is tied to a certain piece of land. Louie has some growing up to do and she has the summer to decide the direction of her future. Does she stay and help the ghost-like Sabine by bringing her victims to kill or does she leave and start a new life with her mom's ex in Florida? I liked the laziness and the setting of the South in this story. "Why Light?" was simply a powerfully moving love story by Tanith Lee about familial obligations in vampire society. Daisha is a rare vampire who can walk in sunlight. To abide by Alliance law, she has to become the wife of Zeev Duvalle and join the two families (her rare ability will help his family's future bloodlines). The third story I wanted to see more of. Cover comment: Ha, I love this cover. The model, while looking seductive and gorgeous, makes you wonder. Is she a vampire or the victim?